Leadsology®: Marketing The Invisible is written for independent professionals for want to enjoy a predictable weekly flow of high quality new client inquiries. 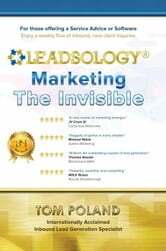 Here's what you'll discover in Leadsology®: Marketing The Invisible. *** Why Marketing The Invisible is more like proposing marriage than it is selling a car. *** Ten commonly taught marketing methods that you should avoid. *** The Titanium Triangle: How to stimulate a weekly flow of high-quality, inbound, new client inquiries. *** The Four Levels of Psychological Allure: How to ethically create a magnetic-like attraction that is all but irresistible to ideal clients. *** The Leadsology® Persuasion Sequence: A ten-part formula to embed into presentations, publications, and pitches that will dramatically improve response rates. *** The SEW Segmentation Formula: A simple formula that increases new client inquiries more than five fold (literally). *** The Four Validations: What your ideal clients need to hear to confirm that investing with you is the right thing to do. *** The Orchestra Conductor: How to free up your time and scale your marketing results through a simple three-step process of segmentation, automation, and outsourcing.